Following yesterday’s post on Seven Deadly Digital Sins I received a couple of requests for digital safety and citizenship resources appropriate for elementary school students. Here are some of my favorite resources for teaching digital safety and citizenship at the elementary school level. PBS Kids offers the Webonauts Academy in which elementary school students can learn about safe online behaviors. When students have completed all of the Webonauts missions they will graduate from the Webonauts Academy. The educators tips page offers some practical suggestions for using Webonauts in the classroom or in a school library. In an effort to teach children about potential dangers online and how to avoid them, the Council of Europe has offers a game called Through the Wild Web Woods. Through the Wild Web Woods is designed for students ages seven through ten to learn how to spot danger on the Internet and what to do when they do spot danger on the Internet. The game is available in twenty-four languages. Professor Garfield is a free resource developed in part by the Virginia Department of Education. Professor Garfield teaches students how to be safe online, how to recognize and respond to cyberbullying, and how to decide if something is a fact or an opinion. These educational activities can be found in the free Professor Garfield apps; Online Safety, Fact or Opinion, Cyberbullying. All of the free Professor Garfield iPad apps use the same format. The format is a set of comic strips that students read to learn about the issues the app is focused on. At the end of the comic strips students play some simple games to practice recognizing good online behaviors. 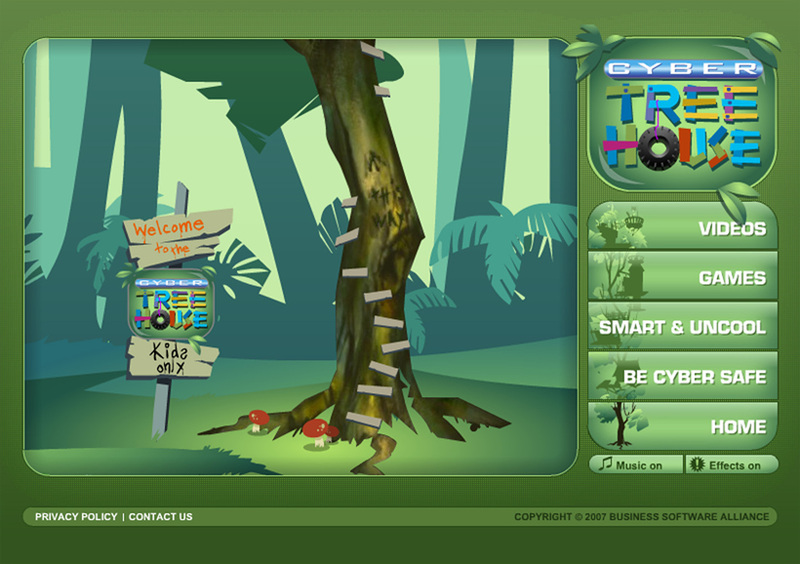 AT&T’s Safety Land is a nice game through which kids learn and practice recognizing danger on the Internet. The game is set in the city of “Safety Land.” As students navigate from building to building in Safety Land they are confronted with a series of scenarios and questions to respond to. If they respond correctly to each scenario they will capture the cyber criminal and send him to the Safety Land jail. Students who send the cyber criminal to Safety Land jail receive a certificate that they can print out. Digital Passport is an online program from Common Sense Media. The purpose of the Digital Passport program is to provide students in grades three through five with lessons and games for learning responsible digital behavior. Digital Passport uses videos and games to teach students about cyberbullying, privacy, safety and security, responsible cell phone use, and copyright. Students earn badges for successfully completing each phase of the Digital Passport program. Webonauts Internet Academy by PBS Kids helps students between eight and 10 years old to recognize the pitfalls of online activity. You can use the game to start a discussion about digital citizenship or to reinforce the points you make during classroom discussion. Younger elementary school students will love AT&T’s Safety Land. As they navigate around Safety Land, students answer questions about Internet safety and, if they answer the questions correctly, catch a cyber criminal and put him away.